Sorbothane® is a, one-of-kind, visco-elastic polymer. A solid that actually “flows” like a liquid - Sorbothane® outperforms rubber, polyurethane and any other insole material at every level. 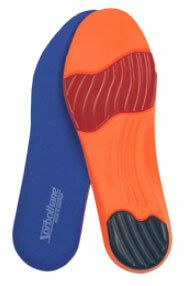 Ultra Sole™ Performance Insoles absorb shock, return energy and provide long lasting comfort. The Ultra Sole™ combines a molded air-infused base with a pure Sorbothane® heel inlay for shock absorbing comfort and impact protection. Strategically placed forefoot pad works to return energy. Proudly made in America by American workers.